3. Night Sky Network News 7. 4. Ozone, the Greenhouse Gas 8. Summer is here, and I enjoy the long hours of daylight it brings. I find it hard to stay up late enough for astronomical twilight to do any observing because I have been active all day. Best way to remedy this is to plan on attending an organized star watch. There are several around the region, as close as Pulpit Rock, to as far as Stellafane in Vermont. Spending a whole weekend, instead of just an evening, forces you to forget the little things that you always remember to do when you are at home, and instead lets you focus on just astronomy. You can plan out what you would like to see at night, get your equipment ready, and talk to friends who are there (or make new ones) about things of interest. All this, plus an organized event offers speakers in the field, vendors with new astro gadgets, and probably a rain shower or two! Oh, sorry, that only applies if BCAAS sponsors the event! We can single -handedly put an end to droughts in Ethiopia if we were to schedule star watches there. The U.N. should be told…. If you can't travel to an event this summer because you don't have a spare $200 for gas, at least get your scope out in the yard and invite the neighbors. They will certainly be impressed with what you can show them in the sky, even if it is just the Moon. Don't feel inadequate about not knowing all there is about astronomy in case they ask questions. They will remember your time spent under the stars with them for a long time to come. I also hope you can attend or club picnic in August. It will be on Thursday, August 14th, our usual meeting night, and we always have a good time. Bring your favorite dish, covered or uncovered, as long as it is remotely edible, we’ll take care of it! Observing afterwards is welcome if you don't have to get up early next morning, as I will have my scope set up if you want a peek. Without the familiar compass points of Earth's magnetic poles, spacecraft use stars and gyros to know their orientation. Thanks to a recently completed test flight, future spacecraft will be able to do so using only an ultra-low power camera and three silicon wafers as small as your pinky fingernail. "The wafers are actually very tiny gyros," explains Artur Chmielewski, project manager at JPL for Space Technology 6 (ST6), a part of NASA's New Millennium Program. Traditional gyros use spinning wheels to detect changes in pitch, yaw, and roll the three axes of rotation. For ST6's Inertial Stellar Compass, the three gyros instead consist of silicon wafers that resemble microchips. Rotating the wafers distorts microscopic structures on the surfaces of these wafers in a way that generates electric signals. The compass uses these signals along with images of star positions taken by the camera to measure rotation. Because the Inertial Stellar Compass (ISC) is based on this new, radically different technology, NASA needed to flight-test it before using it in important missions. That test flight reached completion in December 2007 after about a year in orbit aboard the Air Force's TacSat-2 satellite. "It just performed beautifully," Chmielewski says. "The data checked out really well." The engineers had hoped that ISC would measure the spacecraft's rotation with an accuracy of 0.1 degrees. In the flight tests, ISC surpassed this goal, measuring rotation to within about 0.05 degrees. Engineers at Draper Laboratory, the Cambridge, Massachusetts, company that built the ISC, are already at work on a next-generation design that will improve the compass's accuracy ten-fold, Chmielewski says. So ISC and its successors could soon help costs and spacecraft stay on target. Find out more about the ISC at nmp.nasa.gov/st6. Kids can do a fun project and get an introduction to navigating by the stars at spaceplace.nasa.gov/en/kids/st6starfinder/st6starfinder.shtml. Compass is built as two separate assemblies, the cameragyro assembly and the data processor assembly, connected by a wiring harness. The technology uses an active pixel sensor in a wide-field-of-view miniature star camera and micro-electromechanical system (MEMS) gyros. Together, they provide extremely accurate information for navigation and control. I hope some of you were able to attend the two teleconferences that were recently held. On June 18, we were invited to attend a teleconference for the NASA Solar System Ambassadors with Mr. Eclipse, Dr. Fred Espenak. He discussed eclipses in general, as well as the upcoming solar eclipse on August 1. The speaker for the second program was Dr. Ken Sembach, a Hubble Project Scientist with the Space Telescope Science Institute. He discussed the upcoming Hubble Servicing Mission. With more than 17 years of historic and trailblazing science already accomplished, Hubble will be reborn with Servicing Mission 4 (SM4), targeted for October 8, 2008. Astronauts will use the Shuttle to bring new cutting-edge science instruments to enhance Hubble's capabilities by large factors, as well as gyros, batteries and other crucial devices to further its continued success through the year 2013. If you didn’t get a chance to listen, let me know and I can get you a CD with the PowerPoint and recording of the conference when it is available. They can also be downloaded from the NSN website. The next quarterly drawing will be held July 7 from public events held between April 1 and June 30. The prizes are Chandler planispheres and Rigel System red lights. The NASA Gamma-Ray Large Area Space Telescope (GLAST) left Earth June 11 aboard a Delta II rocket. The GLAST mission is an integral part of the Night Sky Network’s latest toolkit, Supernova. I’ll be giving a short demonstration from the toolkit at our July Member’s Night meeting. As always, anyone wanting more information regarding the Night Sky Network please feel free to contact me. astronomy lessons for you & your kids! We all know that ozone in the stratosphere blocks harmful ultraviolet sunlight, and perhaps some people know that ozone at the Earth's surface is itself harmful, damaging people's lungs and contributing to smog. But did you know that ozone also acts as a potent greenhouse gas? 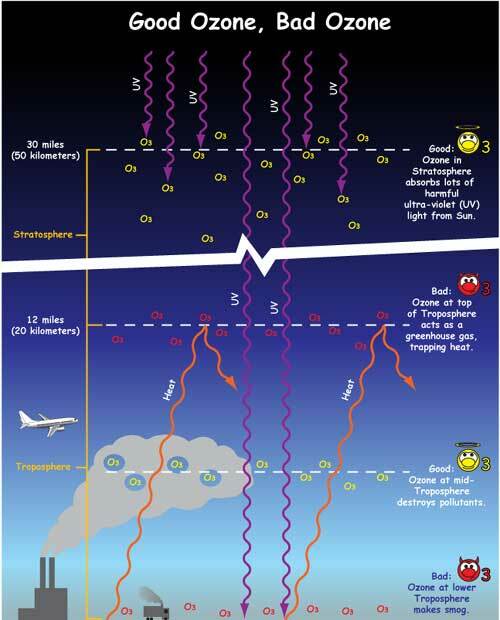 At middle altitudes between the ground and the stratosphere, ozone captures heat much as carbon dioxide does. In fact, pound for pound, ozone is about 3000 times stronger as a greenhouse gas than CO 2 . So even though there's much less ozone at middle altitudes than CO 2 , it still packs a considerable punch. Ozone traps up to one-third as much heat as the better known culprit in climate change. Scientists now have an unprecedented view of this mid-altitude ozone thanks to an instrument aboard NASA's Aura satellite called the Tropospheric Emission Spectrometer—"TES" for short. Most satellites can measure only the total amount of ozone in a vertical column of air. They can't distinguish between helpful ozone in the stratosphere, harmful ozone at the ground, and heat -trapping ozone in between. By looking sideways toward Earth’s horizon, a few satellites have managed to probe the vertical distribution of ozone, but only to the bottom of the stratosphere. Unlike the others, TES can measure the distribution of ozone all the way down to the heat-trapping middle altitudes. "We see vertical information in ozone that nobody else has measured before from space," says Annmarie Eldering, Deputy Principal Investigator for TES. The global perspective offered by an orbiting satellite is especially important for ozone. Ozone is highly reactive. It is constantly being created and destroyed by photochemical reactions in the atmosphere and by lightning. So its concentration varies from region to region, from season to season, and as the wind blows. Data from TES show that ozone's heat trapping effect is greatest in the spring, when intensifying sunlight and warming temperatures fuel the reactions that generate ozone. Most of ozone's contribution to the greenhouse effect occurs within 45 degrees latitude from the equator. Increasing industrialization, particularly in the developing world, could lead to an increase in mid-altitude ozone, Eldering says. Cars and coal-fired power plants release air pollutants that later react to produce more ozone. "There's concern that overall background levels are slowly increasing over time," Eldering says. TES will continue to monitor these trends, she says, keeping a careful eye on ozone, the greenhouse gas. Learn more about TES and the science of ozone at tes.jpl.nasa.gov/. Kids can get a great introduction to good ozone and bad ozone at spaceplace.nasa.gov/en/kids/tes/gases. The MSLstore.com has been created for employees and mission team members of JPL and NASA. These logo collectible and apparel products have been approved for public purchase. Online stores are open periodically for limited times. May 25th, 2008 marking a historic day in exploration. The Phoenix Lander discovers water on the Martian surface. The MSL and Phoenix Lander online store is open to the public until the end of July. Mars Science Laboratory is scheduled to launch. If you are a member of BCAAS, you can purchase an Astronomy wall calendar again at a significant discount. The regular price is $12.50. However as a member of BCAAS, you can buy them at $6.50 each! The images displayed in the 2009 calendar are: a spectacular view of a comet, a spiral galaxy, the Carina Nebula, Saturn, the Antenna Galaxies, a star-forming region, Large Magellanic Cloud in infrared, star field in Sagittarius, the Bubble Nebula, the Tarantula Nebula, supernova remnant in Cassiopeia, and Victoria Crater and Opportunity Rover. Let me know as soon as possible if you want one or more ordered. I will start the list. I will also send an e-mail to the club members on the e-mail list as another reminder that it is calendar time again. Usually I send in the main order to Kalmbach after the September meeting so we don’t risk Kalmbach running out of calendars. The calendars will be brought to the meeting from October through December. Anyone who has not picked up their calendar by the December meeting, I will mail as in the past. However considering that postage has gone up AGAIN, anyone who can reimburse us for the postage will be appreciated. You can contact me at Ljsbach@cs.com or you can call me at 610-375-9062 in the evenings. Thursday, July 31—Saturday, August 2 Almost Heaven Star Party at Spruce Knob, WV hosted by NOVAC. For details, visit www.novac.com. Star Watch for Blue Marsh Lake Park at the Dry Brooks Day Use Area Pavilion on top of the hill past the gates. BCAAS Annual Picnic at Deerfoot Farm! THIS IS OUR REGULAR MEETING NIGHT! PLEASE DON’T GO TO THE MUSEUM! sweet corn will be provided! Yay! BCAAS General Meeting at Reading Museum Auditorium, topic TBA.